Revision 6/26/11: I've decided not to release a pattern, since you guys are making such cool things with it without me! Enjoy! Okay, so I did this chart awhile ago and posted it on Ravelry with the idea. Someone actually did a really cute version of it there and posted it - so awesome! Once I get around to actually doing it I'll write up the full-hand pattern. "The black is stockinette, the white is garter on the outside, purl bumps on the inside. 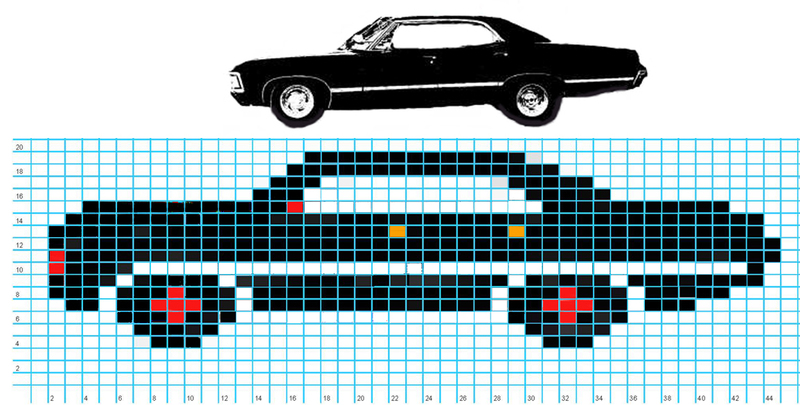 The red and orange are special stitches to set off the attributes of the car. I'm thinking some kind of bobble perhaps? Anywho, that's where I'm at with figuring out something :-) Its 20 x 44, so it could easily fit inside a 50x50 cloth." This is just what I'm looking for. I'm working on knitting it now. Would you mind if I use your pattern as the base for an illusion scarf? I have completed and posted the Metallicar Illusion Scarf. You can find the pattern at my blog. Thank you again for allowing me to use your pattern as the base for it. Ha ha...Santa is secretly a woman!